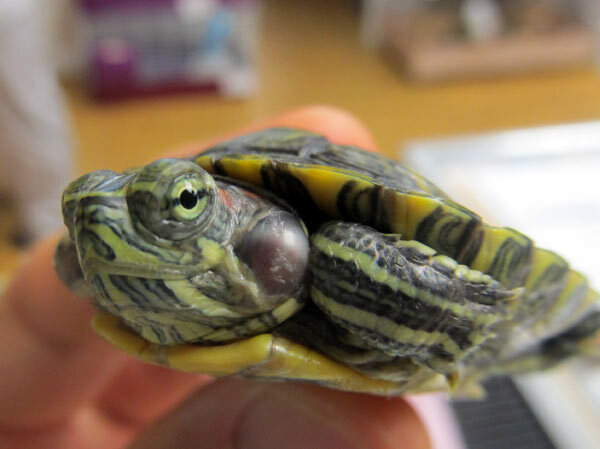 Aural abscesses (ear infections) in turtles are one of the most common medical conditions we see in exotic veterinary practice. Fairly easy to diagnose due to the obvious swelling on the sides of the head where the ears are located, these abscesses can occur in one or both ears. The swelling is caused by exudates/pus that forms within the ear canal pushing on the skin. Often these pet turtles have stopped eating and feel some discomfort. The main causes of aural abscesses are not completely understood, but in almost 90% of the cases they are related to poor husbandry conditions. With any one of these husbandry problems, turtles may develop an aural abscess, and unfortunately, most turtles we treat have several of these problems. Here are some key factors that contribute to these infections. • Vitamin A is crucial for the generation of cells that line the respiratory tract and skin. Without it, turtles may succumb to many kinds of illnesses including aural abscesses. Often captive turtles will be fed only one kind of food, such as krill shrimp, when their dietary requirements needs to include formulated pellets, live feeder fish, high vitamin A vegetables such as carrot and squash, and nutrient rich dark green leafy veggies/aquatic plants. • When turtles live in water without an appropriate water filter, urine, feces, leftover food, bacteria, and fungal organisms cause severe irritation to the skin. Often over time, this chronic irritation can lead to bacterial infections of the aural cavity and/or the skin and shell. • When they are not kept at proper temperatures, their immune system becomes weakened making them more susceptible to bacterial infections. • Without direct, unfiltered sunlight or a high quality UBV bulb (bulbs must be changed every six months) they cannot absorb calcium, further diminishing their immune system and setting them up for metabolic imbalance. • Environmental stress can also contribute to a weakened immune state. 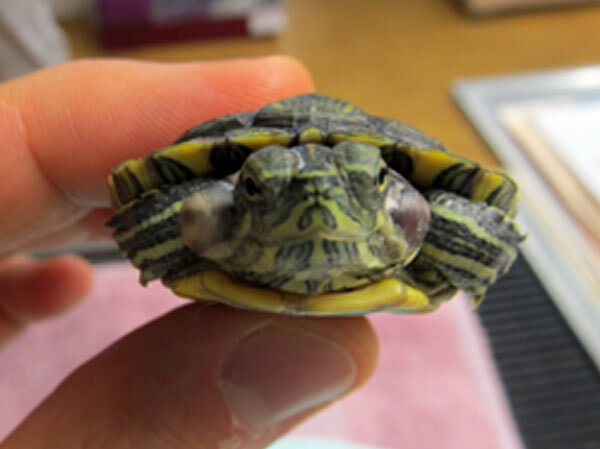 Sources of environmental stress can include a tank that is too small, not enough docking areas to get out of the water, overcrowding with too many turtles, not enough time with access to water, or too much handling. Treating these abscesses must occur at the veterinary hospital. First, the turtle receive sedation or local anesthesia and pain management. Next, the abscess needs to be opened up and thoroughly flushed clean so all of the pus is removed. Sometimes, if the veterinarian suspects bacterial infection, they may recommend taking a sample for cultures. Generally, the skin will be left open so the abscess can continue to drain while the pet is healing. There may be a bloody discharge for at least a day or two following the procedure. During the healing, owners will have to care for the turtle at home with various treatments that may include pain management, cleaning with antiseptics, applying topical medications, antibiotics by injection, and managing dry docking the patient while making sure the water is filtered clean in order to prevent delayed healing. The majority of these abscesses are classified as “sterile” in that the cause is not a bacterial infection as is the case with many other types of abscesses. If you suspect that your turtle is suffering from an aural abscess, contact your exotic veterinarian right away. It is a treatable condition. However, it is important to reiterate that it is a preventable condition. So be sure to take your pet turtle to an exotics veterinarian for a post purchase exam and annual wellness check-ups to ensure good health and to avoid this and other preventable illnesses.